Ni(II)-dimethylglyoxime ion-imprinted polymer (Ni(II)-DMG IIP) was encapsulated in polysulphone and electrospun into nanofibres with diameters ranging from 406 to 854 nm. The structures of the Ni(II)-DMG encapsulated-IIP nanofibre, non-imprinted encapsulated-polymer nanofibre and polysulphone nanofibre mats were observed by scanning electron microscopy and evaluated by infrared spectroscopy. Electrospinning increased the specific surface area of the Ni(II)-DMG encapsulated-IIP nanofibre mats, as was evidenced by the low masses of the Ni(II)-DMG encapsulated-IIP nanofibre mats used. The accuracy of the method was validated by analysing a custom solution of certified reference material (SEP-3); the concentration of Ni(II) obtained was close to the certified one. The limit of detection was found to be 4.0x10-4 µg·mℓ-1 while the limit of quantification was found to be 1.2x10-3 µg·mℓ-1. The recovery of Ni(II) achieved using the Ni(II)-DMG imprinted nanofibre mats in water samples was found to range from 83 to 89%, while that of non-imprinted nanofibre mats was found to range from 59 to 65%, and that of polysulphone from 55 to 62%. Contamination of water by heavy metals is a major concern around the world (Momodu and Anyakora, 2010; Mansour and Sidky, 2002; Rico et al., 1989; Miller et al., 2004; Dhakate and Singh, 2008). Heavy metals are ranked high among the most important pollutants in natural and treated water resources. Though they occur only in trace concentrations (mg·ℓ-1) in the environment, they tend to bioaccumulate in the food chain and exert various health effects on humans. There is therefore the need for a regular, quick and accurate determination of the heavy metals in the environment. The direct quantification of the heavy metals in samples has, however, proven to be a challenge as their concentrations are usually below the detection limits of many analytical instruments. It is therefore important to have more rigorous sample pre-treatment methods in order to remove complex matrices before analysis. Various pre-concentration techniques, such as open beaker acid digestion (Balcerzak, 2002; Rechcigl and Payne, 1989), microwave digestion (Rechcigl and Payne, 1989; Sarin et al., 2004), slurry techniques (Lima et al., 2000), chemical precipitation (Massoumi and Hedrick, 1969), electro-deposition (Ruotolo and Gubulin, 2002), cementation (Chang et al., 2007), ultra-filtration (Hong et al., 1998), ion exchange (Shao et al., 1991), activated carbon adsorption (Wilson et al., 2006), liquid-liquid extraction (Bhaskara and Reddy, 2002) and solid phase extraction (Hennion, 1999) (SPE), have been used to abstract trace metals from matrices. These methods have the limitation of poor selectivity, as one sorbent normally picks up several metal ions at once (Pourreza et al., 2010). SPE can be combined with ion-imprinted polymers (IIPs) in order to improve selectivity for ions (analytes) of interest from environmental samples (Ramakrishnan and Rao, 2006; Otero et al., 2009; Romaní et al., 2009; Zhu et al., 2009; Krishna et al., 2004). Ion-imprinted polymers (IIPs) are highly selective crosslinked polymeric materials, synthesised by complexing a template (metal ion) and a functional monomer in the presence of a crosslinker (Nishide et al., 1976). The reaction proceeds via a free radical initiator in an appropriate solvent normally referred to as a porogen. Removal of the template reveals cavities that are complementary in size and charge to the metal of interest. The memory is a result of the effect of the size and charge of the metal ion that was present in the cavity during polymerisation. Hence the cavities have a high recognition/selectivity for the metal ion only. The functional mechanism is similar to that of antibodies or enzymes. However, IIPs have advantages over antibodies in that they are cheap to produce and can be used in or with a variety of solvents at high temperature, pressure and pH conditions which antibodies or enzymes would not tolerate. However, the imprinted polymers also have limitations; for example, the highly cross-linked polymer makes it difficult to completely remove the template (template bleeding) (Ki et al., 2002; Rao and Dave, 1998). There is also a challenge of slow rebinding due to the fact that most of the imprinted sites are not always on the surface (Carter and Rimmer, 2002; 2004). Therefore it is essential to introduce nanotechnology and surface chemistry into imprinted polymers (Xie et al., 2006; 2008). Nanomaterials are becoming popular in sample preparation techniques because of their small size, which enables them to be used in preference to bulk materials (Yoshimatsu et al., 2008a; Chronakis et al., 2006a, 2006b; Flavin and Resmini, 2009; Duan et al., 2008; Lehmann et al., 2002). There are several methods that can be used to introduce the IIPs into nanomaterials. 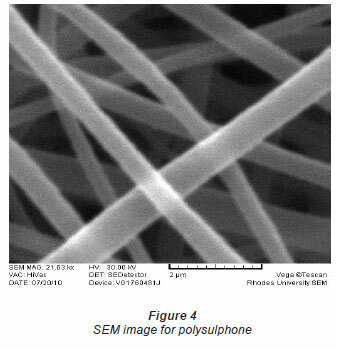 These include nanomoulding, which is used to produce imprinted nanowires (Yang et al., 2005), preparation of surface-imprinted nanowires, which is used to produce imprinted nanotubes (Xie et al., 2006), and electrospinning, which is used to incorporate imprinted nanoparticles into electrospun nanofibres (Wang et al., 2006; Chronakris et al., 2006a; Yoshimatsu et al., 2008a, 2008b). Electrospinning is the most efficient, simple, and versatile method of introducing nanomaterials into sample preparation techniques, due to its relatively simple and cost-effective setup (Miao et al., 2010; Wang et al., 2009; Teo and Ramakrishna, 2005; 2009; Subbiah et al., 2005; Zhang et al., 2005). Electrospinning is a process for producing continuous polymer nanofibres, of diameter 10-1 000 nm, through the application of a high voltage to the polymer solution (Ramakrishna et al., 2005; Wang et al., 2009; Miao et al., 2010; Duan et al., 2008; Jantarat et al., 2008; Teo and Ramakrishna, 2009; Lehmann et al., 2002; Kriegel et al., 2008). The process takes place at an optimal voltage, when the charge induced on the polymer solution is sufficient to overcome the surface tension. A jet is formed and ejected towards a grounded collector, which is normally aluminium foil (Ramakrishna et al., 2005; Wang et al., 2009; Miao et al., 2010; Kriegel et al., 2008). Due to their small size, the nanofibres have high specific surface areas, which enhances the interaction between analyte and sorbent, thus improving adsorption performance. This paper reports the synthesis of nickel (II)-dimethyl glyoxime encapsulated ion-imprinted polymer (Ni(II)-DMG IIP) nanofibre mats that were used to selectively trap Ni(II) ions in aqueous solutions. This is the first encapsulated-polymer nanofibre work performed with ion-imprinted polymers synthesised by bulk polymerisation. The polymerisation methods used by previous studies were precipitation polymerisation (Yoshimatsu et al., 2008a; Chronakis et al., 2006a) and miniemulsion polymerisation (Lehmann et al., 2002). Analytical grade ammonium acetate, 4-vinylpyridine, 2,2'-azobisisobutyronitrile (AIBN), 2-methoxy ethanol, styrene, nickel(II) sulphate hexahyrate (NiSO4.6H2O), divinyl benzene, dimethylglyoxime (DMG), trace metal grade nitric acid, hydrochloric acid, dimethyl formamide, polysulphone and stock solution of Ni(II) were obtained from Sigma Aldrich (Steinheim, Germany). Filter paper was acquired from Whatman (Maidstone, UK). An A10 milli-Q system from Millipore RiOs (Bedford, USA) was used to generate ultrapure water. A custom solution of certified reference material (CRM), SEP-3, was obtained from Inorganic Ventures (Christiansburg, USA). Scanning electron microscopy images were acquired by a TS5136ML Digital Vega Microscope from Tescan (Brno, Czech Republic). FTIR (400-4 000 cm-1) spectra were recorded on a PerkinElmer Spectrum 100 spectrometer (Massachusetts, USA) equipped with a universal ATR sampling accessory. Concentrations of metals were determined using an iCAP 6000 Series inductively coupled plasma-optical emission spectrometer (ICP-OES) from Thermo Electron Corporation (Cheshire, United Kingdom). The solution pH was measured using the Jenway 3510 pH meter (Essex, UK). Ni(II)-DMG IIP and non ion-imprinted polymers were prepared using the protocol described by Rammika et al. (2011). The optimisation was carried out by the uniform design experimental method (Rammika et al., unpublished data; Zhu et al., 2007). It was ensured that only the finest particles passed through the 2 µm sieve. 200 mg of Ni(II)-DMG IIP was suspended in 10 mℓ dimethyl formamide and 200 mg polysulphone (PSU) and the solution was stirred for 3 h.
The electrospinning of the Ni(II)-DMG IIP suspended in dimethyl formamide and polysulphone, to form Ni(II)-DMG nanofibre mats, was carried out at room temperature at a positive voltage of 15 kV; a counter electrode was set at 5 kV. A copper wire was mounted on the spinneret and used as a positive electrode. Aluminium foil was used a counter electrode and mounted at a distance of 12 cm from the spinneret. Fibres were collected on the aluminium foil in the form of a mat. The mat was stored in a desiccator for 6 h to remove solvent and the fibre was then washed 3 times with 50% HCl and 3 times with ultrapure water. 30 mℓ of aqueous sample was spiked with 2 µg·mℓ1 of Ni(II) and 15 mg of Ni(II)-DMG encapsulated-IIP nanofibre mats or non-imprinted nanofibre mats was put into the sample. The sample was shaken for 1 min and the change in Ni(II) concentration was taken to be the concentration of Ni(II) adsorbed by the nanofibre mats. Sea, river, untreated sewage and treated sewage water samples were collected in polyethylene containers by the grab sampling method. 100.0 mℓ portions of water samples doused with 2.0 mℓ conc. HNO3 and 5.0 mℓ conc. HCl were digested by heating on a hot plate at 90ºC until the volume was reduced to 20.0 mℓ. The solution was then filtered through Whatman No. 1 filter paper after allowing it to cool, and diluted to 100.0 mℓ with ultrapure water prior to ICP-OES analysis (Method 3005A, 1992). A set of 3 replicates of 30.0 mℓ portions of 2 µg·mℓ-1 Ni(II) solutions were prepared and their pH adjusted from 1.0 to 12.0. From pH 1-3, the hydrochloric acid/ potassium chloride buffer was used, for pH 4-6, sodium acetate buffer was used and for pH 7-12, the disodium hydrogen phosphate buffer was used. Then 10.0 mg of Ni(II)-DMG encapsulated-IIP nanofibre mats was added into each solution and the solution was stirred for 5 min. For mass optimisation, 5.0 to 60.0 mg of leached Ni(II)-DMG nanofibre mats were weighed into each solution and the solutions were shaken for 30 min. To optimise for time needed for Ni(II) rebinding, equal volumes of Ni solutions (30.0 mℓ ) were taken and adjusted to pH 8.0 using the disodium hydrogen phosphate buffer. Times for rebinding of Ni(II) ranging from 30 s to 300 s were evaluated. Cs is the solution concentration after adsorption. b is the Ni(II) conc. value obtained without digestion(µg·mℓ-1). The diameter of the Ni(II)-DMG encapsulated-IIP nanofibre mats (Figs. 1 and 2) ranged from 406 to 854 nm while that of polysulphone (Figs. 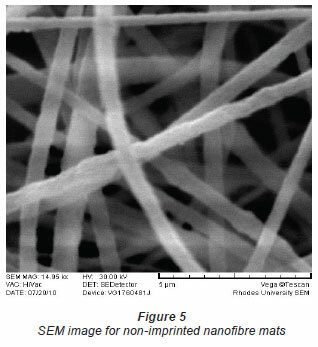 3 and 4) ranged from 571 to 1 236 nm and that of DMG non-imprinted nanofibre mats (Fig. 5) from 574 to 823 nm. The values for the nanofibre mats are in the nano range (1-1 000 nm), though DMG non-imprinted nanofibre mats were larger than the imprinted mats. As shown in Figs. 1 and 2, the Ni(II)-DMG encapsulated-IIP nanofibre and DMG nonimprinted nanofibre mats are rough, with some beads (which are presumably due to Ni(II)-DMG IIP and non-imprinted polymers), while PSU alone is smooth. In previous studies, diameters of 200-300 nm (Chronakis et al., 2006a; Chronakis et al., 2006b), 130-2 400 nm (Yoshimatsu et al., 2008a) were obtained and non-imprinted nanofibre mats were found to be larger than the imprinted nanofibre mats, as was the case here (Figs. 1, 2 and 5). The IR spectrum of the Ni(II)-DMG encapsulated-IIP nanofibre mats (as shown in Fig. 6C) shows the presence of an OH deformation band at 1737 cm-1, indicating the formation of a hydrogen bridge (Burger et al., 1965; Cardoso et al., 2009; Nyquist, 2001). This hydrogen bridge confirms the formation of the red square planar Ni(II)-DMG IIP complex in the nanofibre mats and is absent in the PSU and in the DMG non-imprinted nanofibre mats (as shown in Figs. 6A and 6B). This OH deformation band was also present in Ni(II)-DMG IIP and absent for the DMG non-imprinted polymer (Rammika et al., 2011). There is a peak at 930 cm-1 in the spectra of both the DMG imprinted and non-imprinted nanofibre mats, which is due to the oxime functional group; this peak is absent from the spectra for polysulphone as this does not have an oxime group (Socrates, 2001). In pH adjustment studies, the Ni(II)-DMG encapsulated-IIP nanofibre mats were subjected to the extremes of pH which it was able to withstand. 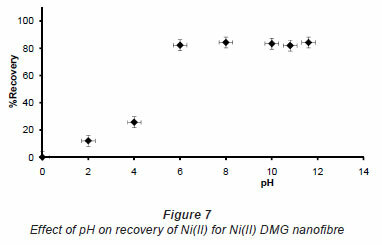 At pH 0 to 4.0 the recoveries for the Ni(II)-DMG encapsulated-IIP nanofibre mats ranged from 0 to 26% and good recoveries (72-84%) were recorded in the pH range of 6.0 to 10.0. Beyond pH 10.0, recoveries dropped (Fig. 7). 15 mg was taken as the optimum mass as recoveries increased from 59 to 84% as the mass was increased from 5 to 10 mg, but remained almost constant from 15 to 60 mg (Fig. 8). The highest recovery obtained with this mass was 90%, which is comparable to a recovery of 99.1% obtained by Amais et al. (2007), who used 50 mg of multi-wall carbon nanotubes (which are also nanomaterials) as sorbent for on-line nickel pre-concentration in water samples. 50 mg was also used for Ni(II)-DMG IIP (Rammika et al., 2011). Yoshimatsu et al. (2008a), using propranolol electrospun molecularly-imprinted nanoparticles, obtained a recovery of 80% in water samples, using a mass of 5 mg of the nanofibre mat. Chronakris et al. (2006a) used 2 mg of the fibre mat and achieved a recovery of 88% using poly(ethylene terephthalate) (PET) as the supporting nanofibre matrix to encapsulate theophylline and 17;6-estradiol imprinted nanoparticles. 3.5 mg of the nanofibre mat was used by Chronakris et al. (2006b), who obtained a recovery of 75% when they electrospun PET and polyallylamine in the presence of a template molecule, 2,4-dichlorophenoxyacetic acid (2,4-D), used the nanofibre to enrich 2,4-D from aqueous solutions. 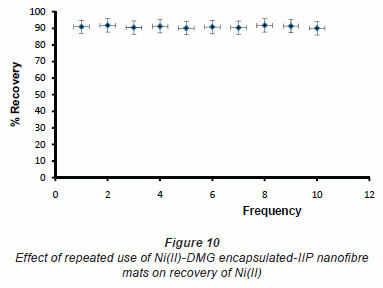 The optimum time required for binding of the Ni(II) to Ni(II)-DMG encapsulated-IIP nanofibre mats was 210 s, as recoveries increased from 45% at 30 s to 90% at 210 s, after which the recovery remained almost constant (Fig. 9). Though this was longer than the 60 s which was found to be optimal when using Ni(II)-DMG IIP (Rammika et al., 2011), it is less than the periods of 1 h (Yoshimatsu et al., 2008a) and matsachieved a recovery of 88% using poly(ethylene terephthalate) (PET) as the supporting nanofibre matrix to encapsulate theophylline and 17β -estradiol imprinted nanoparticles. 3.5 mg of the nanofibre mat was used by Chronakris et al. (2006b), who obtained a recovery of 75% when they electrospun PET and polyallylamine in the presence of a template molecule, 2,4-dichlorophenoxyacetic acid (2,4-D), used the nanofibre to enrich 2,4-D from aqueous solutions. The optimum time required for binding of the Ni(II) to Ni(II)-DMG encapsulated-IIP nanofibre mats was 210 s, as recoveries increased from 45% at 30 s to 90% at 210 s, after which the recovery remained almost constant (Fig. 9). Though this was longer than the 60 s which was found to be optimal when using Ni(II)-DMG IIP (Rammika et al., 2011), it is less than the periods of 1 h (Yoshimatsu et al., 2008a) and 4 h (Chronakris et al., 2006a; Chronakris et al., 2006b) obtained previously with other imprinted nanofibres. 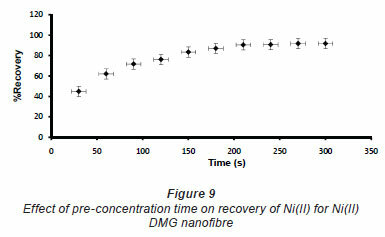 The Ni(II)-DMG encapsulated-IIP nanofibre mats could be used up to 10 times without a noticeable decrease in recovery (Fig. 10). This is much better than the 2 times that was achieved with Ni(II)-DMG IIP (Rammika et al., 2011). The Ni(II)-DMG encapsulated-IIP nanofibre mats had high selectivity towards Ni(II), as the recovery for Ni(II) was much higher than for Co(II), Cu(II), Zn(II), Pd(II), Ca(II), Mg(II), Na(I) and K(I), demonstrating that the cavities in the Ni(II)-DMG encapsulated-IIP nanofibre mats had higher affinity for Ni(II), as shown in Table 1. Despite the fact that Fe(II), Co(II) and Cu(II) (Zen and Lee, 1993; Ershova and Ivanov, 2000; De Sousa and Korn, 2001) are known to interfere with the complexation of nickel with DMG, these metals did not show any interference with the extraction efficiency of Ni(II) when the Ni(II)-DMG encapsulated-IIP nanofibre mats were used. Although DMG is selective to both Pd(II) and Ni(II), it seems that, in this case, Ni(II)-specific cavities were created. This was evidenced by the lower extraction efficiencies recorded for Co(II), Cu(II), Zn(II) and Pd(II), which all have about the same size and charge as Ni(II). Fe(II) had a reasonably high recovery but did not interfere with the determination of Ni(II), as shown by the good recoveries of Ni(II) when Fe(II) concentration was increased from 2 µg·mℓ-1 to 4 µg·mℓ-1. 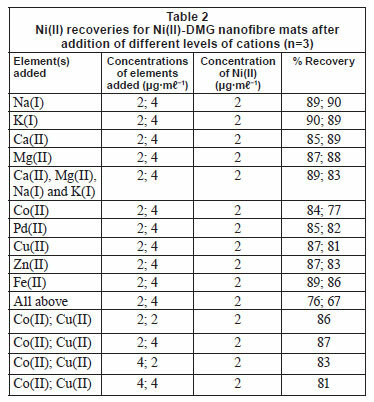 Zn(II), Pd(II), Fe(II), Ca(II), Mg(II), Na(I) and K(I) did not interfere with the binding of Ni(II) on the IIP, as shown in Table 2. Cu(II) and Co(II) were found to slightly interfere with the rebinding of Ni(II) and interaction studies were therefore performed for them, as shown by the last 4 entries in Table 2. To compute the main effect of Cu(II) on Ni(II) for the 2-factorial design experiments, the average response at all runs with Cu(II) at the high setting were computed and the average response of all runs with Cu(II) set at low were subtracted (Montgomery, 2005). The same was done for the main effect of Co(II). Interaction between Co(II) and Cu(II) was calculated by multiplying the settings of Co(II) and Cu(II) and then averaging the responses at high setting and subtracting the average at low setting (Montgomery, 2005). The value of the effect of Co(II) on Ni(II) was found to be -4.5 while the effect of Cu(II) on Ni(II) was found to be -0.5. For an interaction to be taken as significant, it has to be more than 5. This shows that the interference of the 2 metals in the recovery of Ni(II) is not significant. Most ion-imprinting and nanofibre literature does not present these data, which can help to evaluate the effect of Co(II) on rebinding of Ni(II), as the 2 ions compete severely (Griffing et al., 1947; Yang and Black, 1994; Kumbasar and Sahin, 2008). Interference studies by Amais et al. (2007) also showed that Zn(II), Cd(II), Cu(II), Ba(II), Cu(II), Pb(II), Mn(II), Co(II), Cr(III), Ca(II), Mg(II), Na(I) and K(I) did not interfere with the binding of Ni(II) on the multi-wall carbon nanotubes. Selectivity studies conducted by Yoshimatsu et al. (2008a) using propranolol electrospun molecularly-imprinted nanoparticles as a template showed that recoveries of up to 80% were achieved with propranolol analyte, whereas structural analogues of propranolol had recoveries of 30-50%, which is still larger than the 15% recovery achieved with non-imprinted nanofibres. The propranolol-imprinted nanofibre mats were used to enrich propranolol from water samples. The developed method was validated by analysing a custom solution of CRM of water (SEP-3). The results (Tables 3 and 4) showed that the value obtained from the method is within the error of the CRM value. The %RSD was found to be 4.57. Accuracy of the determinations, expressed as relative error between the certified and the observed values of the reference material, were < 0.3%. The precision of these measurements, expressed as RSD for 5 independent determinations, was also satisfactory, being lower than 5% in all cases. The limit of detection (LOD) of Ni(II) using the Ni(II)-DMG encapsulated-IIP nanofibre mats was found to be 0.0004 ± 0.0001 Mg·mℓ-1 while the limit of quantification (LOQ) was 0.0012 Mg·mℓ-1, whereas the LOD and LOQ of Ni(II)-DMG IIP (Rammika et al., 2011) was found to be 0.0003 ± 0.0001 Mg·mℓ-1 and 0.0009 Mg·mℓ-1, respectively. Amais et al. (2007) used multi-wall carbon nanotubes as sorbent for on-line nickel preconcentration in water samples and obtained an LOD of 0.0041 Mg·mℓ-1 and an LOQ of 0.0136 Mg·mℓ-1. Yoshimatsu et al. (2008a) obtained an LOD of 0.001 Mg·mℓ-1 in water samples using electrospun molecularlyimprinted nanoparticles with propranolol as a template. The Ni(II)-DMG encapsulated-IIP nanofibre mats achieved very good recoveries (90-91º%) for the spiked CRM samples; in the previous study recoveries for the spiked CRM samples for the Ni(II)-DMG IIP were found to be 99-100% (Rammika et al., 2011). The values of LOD, LOQ and recoveries for the spiked CRM samples were better for Ni(II)-DMG IIP than for Ni(II)-DMG encapsulated-IIP nanofibre mats. This is testified to by the lower masses of the nanofibre mats used compared to the corresponding IIPs. The Ni(II)-DMG encapsulated-IIP nanofibre mats were then used to determine the concentration of Ni(II) in water samples (Table 5). The recoveries were very good and enrichment factors were found to range from 2 to 13. This shows that the up to 13-fold improvement in recoveries was achieved when using the Ni(II)-DMG encapsulated-IIP nanofibre mats. Enrichment factors of Ni(II)-DMG IIP were previously found to range from 2 to 18 (Rammika et al., 2011). Recoveries for the Ni(II)-DMG IIP were previously found to range from 93 to 100%, while recoveries for the Ni(II)-DMG nanofibre mats ranged from 83 to 89%. Amais et al. (2007) used multi-wall carbon nanotubes as sorbent for on-line nickel preconcentration in water samples and obtained a recovery ranging from 95.7 to 99.1%. The DMG non-imprinted nanofibre mats had recoveries ranging from 59 to 65% and the PSU had recoveries ranging from 55 to 62%. Chronakris et al. (2006a) also achieved recoveries of 88% using PET as a supporting nanofibre matrix to encapsulate theophylline and 17P-estradiol imprinted nanoparticles. A recovery of 75% was achieved by Chronakris et al. (2006b) when they generated artificial molecular recognition sites in the nanofibre itself. Yoshimatsu et al. (2008a) achieved a recovery of 80% when they encapsulated propranolol-imprinted nanoparticles in poly(ethylene) terephthalate nanofibres. This shows that the binding sites in the nanofibre are available even after encapsulating. The Ni(II)-DMG encapsulated-IIP nanofibre mats were prepared for the selective determination of Ni(II) relative to other closelyrelated metal ions in complex aqueous matrices. Though the time for rebinding was not reduced relative to Ni(II)-DMG IIP, the study was successful in that nanotechnology (electrospun nanofibres) was combined with imprinted polymers, opening a wider window for application of imprinted nanofibre mats for enriching metal ions in complex aqueous matrices. 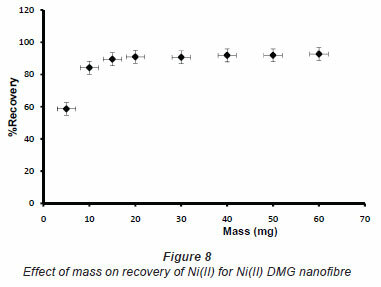 High Ni(II) recoveries with good %RSD, EFs, LOQ and LOD were obtained with lesser masses of Ni(II)-DMG encapsulated-IIP nanofibre mats relative to Ni(II)-DMG IIP. It was also found that the nanofibres were more recyclable than the IIPs. The performance of the Ni(II)-DMG encapsulated-IIP nanofibre mats was validated by analysing a CRM, and then successfully using the mats to trap Ni(II) ions from sea, river and sewage water samples. From the results presented in this work, the Ni(II)-DMG encapsulated-IIP nanofibre mats offer a good opportunity to be used as sorbent in solid-phase extraction from aqueous samples. This is mainly based on their high surface-to-volume ratio which improves the accessibility to analytes of the imprinted cavities in polymers. The authors wish to thank the 'Strengthening Capacity in Agricultural Research and Development in Africa (SCARDA)' programme for financial support and Department of Agricultural Research, (Botswana) for granting study leave to the first author. Received 3 February 2011; accepted in revised form 5 September 2011.